April 13, 2009 Easter Greetings : Let us resurrect Champaran It is an inspiring coincidence that as an important section of my electorate celebrates Christ’s resurrection, I am finding crowds full of enthusiasm and support in my effort to resurrect Champaran. I extend warm greetings to all this Easter Monday. Yesterday, on my morning walk, I visited the St Mary’s Cathedral at the Christian Quarters in Bettiah. Hundreds of families had turned up for the Holy Mass. The local Diocese had decorated the Church premises beautifully. And it was so Champaran like. The mood was just like other festivals- Eid or Diwali. The tranquil and colourful canvas that captured the eye told just one story: of oneness, peace and progress. I felt happy to be there, to greet the young and the old. The affectionate handshake, the reassuring pat or the quiet smile in acknowledgement of my greetings also told just one story: How Champaran loves its festivals. All this told yet another story : of Champaran’s intrinsic secularism. I was not the only non-christian who had come to wish our christian brethren. There were scores of Hindus and muslims. Neither was I the only Lok Sabha candidate who had come calling with wishes on this holy day. I did spot the Congress nominee Sadhu Yadav entering the church. He looked religiously radiant with a red tika on his forehead. While a congregation came out after one Mass and others went in for the second Mass, I lighted candles in front of Mother Mary’s idol near the gate, stood near by and greeted people. Christianity came to Bettiah in the eighteenth century from Nepal. The Italian Capuchin priests from Leh led a small band of Newari converts from Nepal and found refuge in Bettiah Raj. A mission was established at Bettiah and the local Raja gave land grant of two hundred bighas at Dussaiya, popularly known as Padri-Dussaiya since then. Another mission came up at Chuhari in Chanpatia block, not far from my own village Barharwa. Missions came up at Chakhni near Bagaha and at Rampur near Mainatar. The christian mission has played an important part in Champaran’s progress, especially in the field of education. Young men and women who have passed out from mission schools of Champaran have made their mark in different fields. To name just two such educational institutions, Khrist Raja High School for boys and St Theresa’s High School for girls have carved a niche for themselves both within and outside Bihar. Many leaders of the church including Arch- Bishop Benedict Osta and the present Bishop of Bettiah Victor Henry Thakur have been born and educated here. Actor Manoj Bajpai, who is part of my unit in my under production film ‘RAJNEETI’, too has studied in mission schools in Bettiah. Social-cultural traditions of Bettiah christians too have much in common with other communities of Champaran. Even marriage rituals find commonality here. Champaran’s secular fabric gets much of its rich hue from its christian community. This is no election rhetoric but just a reiteration to preserve and enrich our secular bonding. That is why we must be careful and guard against any covert or overt attempt to disturb social peace. We need this peace to march forward. We need this peace to generate means to generate employment opportunities and avenues to create wealth at home. We need to maintain our secular fabric to weave dreams to life. 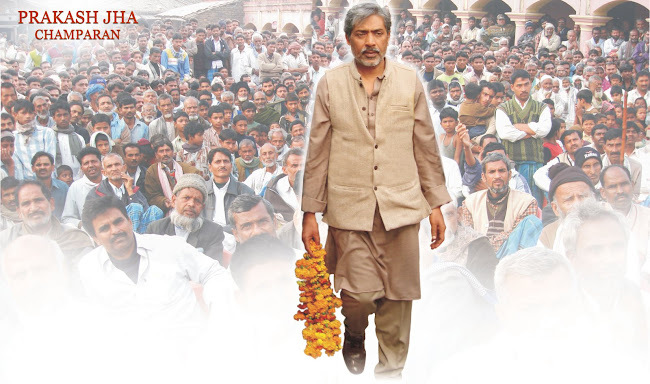 – Prakash Jha. Raj kishore we do not agree with your sickening thoughts and opinion. Why donot produce a film with a background depicting life of of leasser known community of Bettiah Christian. What good will that do?65 years we have wasted in vote bank politics of Nehru and exploitation of that place by rajsthani banias like sita Rajgarhia and jhunjhunwalas. Progress of Bettiah is dependant on blessings coming from heaven through His son Jesus christ,who was brought there by king Dhruwa singh hundred of years ago.As a person born at Bettiah and living in Jerusalem and USA I pray constantly for mighty sons and daughters of Bettiah to bring it to it's former glory of BETTIAH RAJ. Greetings from Jerusalem.Israeli film makers and actors have contributed to Bombay film industries for hundreds of years.Contributions of Sulochana aka Ruby meyer and David can not be forgotten in indian black and white films in 40s to 60s.We constantly pray for mighty sons and daughters of Bettiah in coming days for divine blessings and israeli investors in your projrcts.If Bettiah has to come to original glory of king Dhruba singh it will come through restoration of Bettiah Raj and divine power of SON OF GOD.98 million dollars are being invested in India every year from Israel. Your success in Bihar is directly depended on how much you are devoted to creater almighty and Israel.Rabri/lalu yadav has great objection to your investments and progress in Bihar.What buffalo brains want?? ?Resevations and vote bank politics.We are watching you and whole planet 24/7/365.We know about sinful plans of nehru/indira/rajiv/Rahul/Priyanka gandhi.Besides dalits/muslims other people also live in Bihar,what are they suppose to do,leave the land and die over reservations of these so called vote bank people??? No just get organized and bring more international investors including Israel. We do not agree with your sickened opinion.Bettiah citizens deserve better prople and better opinion than yours. What better people than people chosen by GOD almighty of temple mount in Jerusalem.Future of Bettiah is directly related to the will of GOD. Mary as daughter of Yokabed and Elsheba of the tribe of Levi. Judeo israeli roots of mother mary can not be ignored. State of Israel and blessings of GOD is inter related. Politics of BJP and creation of maha dalit vote bank will not last long.Restore BETTIAH RAJ and your glory will come back. Remember King Dhruva singh brought judeo christian faith in Bettiah for some purpose. Via internet and u tube your concerns are watched and read all over the world.We hear you loud and clear frorm Jerusalem and Telaviv.Do not give up,strengthen Bettiah and Biharis. Active voter registration is required in your constituency. CBI is to be independant organization like election commission.Gone are the days of buffalo/toddy brain in Bihar. Can we count on you for restoration of Bettiah raj and palace as historical heritage foundation.Bettiah will bring you in power,that is the promise we make???. If Sanjay jaiswal and his late father Madan jaiswal of Bettiah are poor and oppressed then we have to rewrite the definitions of those word in dictionary.all about Mahadalit/OBCs vote bank politics.Aarakshan politics must go from India now. Divide india on non-dalit/non-muslim/non-mahadalit basis now. Quality education/oppertunity for all 1.3 billion indians today. Abolish 49.5% reservation now or be ready for repartition of India now.No body can stop it any more. Who could have guessed that indira/sanjiv/Rajiv gandhi would be killed like MK gandhi.Pot is boiling all over India,resrvation/vote bank politics has to be abolished or country will be divided in two parts on caste basis.Time has changrd now. Air service for Bettiah from Patna and Delhi/singapore is the only way to bring foriegn investors from all over world.Visits by Bill gates and his wife Melinda gates for past three years and various steps to uplift Bihar is encouraging. If Mayawati with 5000 carores in her pocket and 5000 carores diamonds around her neck is a dalit then we have to redefine dalit's definition in our dictionary in our world. Now we are talking the truth and nothing but the truth. How many thousands carores are hidden in Sonia/priyanka/Rahul/varun gandhi's houses??? When Yahudi film was made it was shown in Liberty cinema in Bettiah. Famous actor Sohrab modi played the role of yahudi and famous dialougue was"romeo ka khoon kya khoon hai,yahudion ka khoon kya pani hai." Today Bettiah people know about yahudis and Israel and 50 billion dollars being pumped into indian economy every year. Work with israeli film makers and Israel,you will see the mirales happening in Bettiah.Restore Bettiah raj and palace and memories king Dhruwa singh. We love your comments and memories,it will revive Bettiah. Bottom line for prosperity of any community is to nurture the root of that community.In this case it is the root of king Dhruwa singh and Bettiah raj and palace.Nurture them and then you will see the progress of Bettiah and west champaran district. Compliments from Kurji hospital,church,community and well wishers of kurji village. Never again jews of the world will be left unprotected. That is very well said.G-d bless Israel. Remember the holocaust and six millions jews burned alive by Adolf hitler.Never,never again. We remember you from Vidyarthi book store in meena bazar and shiva temple in Bettiah Raj palace.You came to see my dad at tin lalten chowk,at that time I was in medical college,Ranchi university. 6 millions jews were burned alive,we remember the holocaust of Adolf hitler.All over the world yahudis remember the day.Never again-never again. Abolish reservation on caste basis today or divide India now.Why everything is 50% reserved for vote bank people? ?Selection on merit only. Madan jaiswal robbed Bettiah for 17 years,now his son sanjay jaiswal is robbing Bettiah as MP.They destroyed the infrastructure of Bettiah ie, roads,bridges,electricity system,hospitals and and promoted jaiswal giri by establishing their own shanti hospital,pharmacy mafia,laboratory mafia and money lending mafia along with rajsthani bania mafia.Please restore Bettiah raj,sheohar raj,Darbhanga raj and abolish maha dalit vote bank of satish kumar and reservation mafia.Equal/quality eucation/oppertunity for all citizens. P.L.Punia,mayawati,kansi Ram all are drug smugglers and destroyers of great India.hang them now. As long as 50% reservation continue to exists there wil be castism or promoting their own caste members by opening more private medical/engineering colleges.Quality education for all citizens is mandatory right of all citizens of india.Creating mahadalit/pasandmanda muslim vote bank like buffalo/toddy brains will destroy BJP rule in bihar by Satish kumar. All infrastructures made by british before 1947 have been destroyed by corrupt politicians/congress/buffalow/toddybrains/sonia/rahul.Hang them now in public. British brought tele communications,railways,postal service,high english school system and joined whole indian sub-continent in to one fabrics and people of that area learned about each others.High caste hindus were very fast to adopt british system and excelled in british education system.Many of our ancestors became thriving lawyers in London.Reservation/vote bank politics brought destruction and division of India.Gandhi family and reservation/vote bank politics is nothing but worse news for indian sub-continent.Abolish Reservation now. Present govt. of India has mandate of 49.5% CITIZENS only.Abolish reservation/vote bank politics now.Complete caste base census and promote income based classification in India now. Sonia italian rajiv gandhi is nothing but another product of italian drug mafia,Rahul/Prianka gandhis are biproducts.Hang them in public.abolish reservation immediately. Congress and rservation vote banks are sinking ships. If you are visiting St.Mary church and Bettiah every month,Please lit a candle in front of mother Mary's altar.It has great power of blessings. Whole Bettiah town looks so sick,deserted,depressed. we do not know why? ?G-d knows the best,when the area will advance and progress??? Again Bettiah Raj is the focal point for the development of Bettiah town and west champaran dist,with it's population of 12 million people.Unless you nurture the roots,tree will not grow and yield fruits.Marwari bania/jaiswal mafias are nothing but white ants eating whole Bettiah and diverting their wealth to Rajsthan state.Only christian community is reivesting in Bettiah in the form of educational institutions and community services.Please Bettiah Raj. Very nice idea,please go for it now. Re invest in Bettiah and Bettiah Raj restoration. Well it sounds very good. Revive and restore Bettiaj and Bettiah Raj palace.Never mind white ants of rajsthani banias aka marwaris and jaiswal mafias. Long live King Dhruwa singh of Bettiah Raj. Restore Bettiah Raj palace and temples in and around the palace.G-d bless. G-d of Israel will bless you. Sir plz show something about our THARUHAT area's poor & uneducated Background . Tharu people in tharuhat are mahabharat people.After mahabharat war was over,all kshatriya male were killed,their wives and daughters ran away to safety in tarai and deep in side mountaneous regions of Nepal with all valuables and loyal male servents.In due course of time these ladies married to their male servents and children were born.Till taday women owns property and owners of the land and whole prperty.Males sit on ground while women sit on chairs.Males salute women because they are desended from queens and princes of mahabharat period.Pradhan,fauzdar are common last name among them. Rohit of Rampur mission,poor and uneducated is the famous word upon which nehru/gandhi family thrived for 65 years.Now common indian citizens want justice for all India with equal oppertunity and merit based selection in every field.Other wise we are heading for another disaster waiting to hit India very soon.Catholic schools are giving best education in Rampur mission,THARUHAT people must prove themselves. We need to revive kingdom of king Dhruwa singh of Bettiah raj and bring back glory of Bettiah for all of us.Prakash jha and his movie industry has that obligation. What happened to Maurya sugar factory??? Remember what you have promised to Bettiah people.....!!!! Your movie satyagrah will be a great success. Do not hide your money in Dubai,Hongkong,Singapore.Invest in Bettiah Raj restoration. your movie CHAKARABIHU was released in Dubai.Did you make good profit there.? Stand with ISRAEL and GOD of Abraham,Isaac,Jecob,Jethro,Moses will bless you through your movie endevours.We hear you loud and clear from Jerusalem.Make a pilgrimage to temple mount in Jerusalem. Rebuild Bettiah Raj palace compound and temples made in 52 acres of land given by Raja of Bettiah. For those who are blessed by G-d in all areas must pay attention to the restoration of Bettiah Raj palace compound. All well wishers of Bettiah,please unite and rebuild Bettiah raj palace compound.